I first became aware of Kelly in February of 2006 when her photo graced the cover of Arizona Highways magazine. For those of you unfamiliar with the publication, the cover is reserved for gorgeous Southwestern scenery. That, she is. In this issue, she’s referred to as the Environmentalist Rancher – a concept that she and her father invented. Kelly Glenn Kimbro is a real life cowgirl who lives and works in the Malpai. Malpai is a Spanish word for bad lands and is an 800,000 acre area across Southern Arizona and New Mexico nestled against the Mexican Border. Land protection: More than 75,000 acres of private land has been designated as ranch land in perpetuity through conservation easements. This protects it as natural wildlife habitat and productive ranch land by preventing subdivision and development. Innovative cooperative land management: The group invented the concept of “Grassbanking” where neighboring ranchers who are experiencing drought can “rest” their ranches from over-grazing by moving their herds to an area under reciprocal conservation agreements. Habitat restoration: They’ve undertaken many restoration projects to restore native grassland and savanna habitat, including an ambitious goal of restoring fire as a natural landscape process. Working with numerous agency and private partners, the group has conducted prescribed fire over 69,000 acres. Monitoring shows that their projects are resulting in improved ecological conditions. Now, this work handed from Kelly’s father to her is transcending another generation. Kelly’s daughter, MacKenzie is stepping into the roles carved out by her mother. 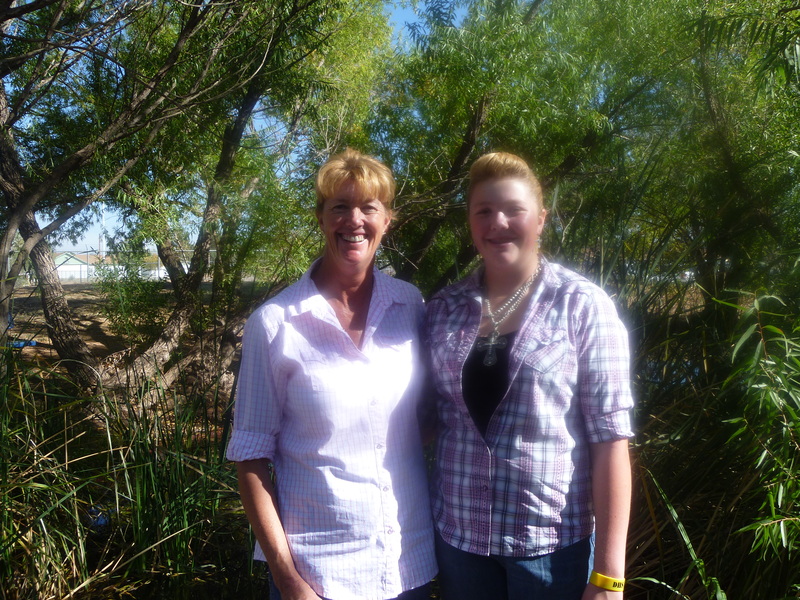 As a member of Future Farmer’s of America and 4-H, she has created a partnership with Arizona Fish and Game and the U.S. Fish and Wildlife Service, and she and her mother are creating an aquatic habitat to help native fish and leopard frogs. This project has included a great deal of hard physical labor clearing invasive plants and building out a pond area. Their intention is to turn this area into an outdoor classroom where high school students can observe and learn about nature. Once complete, they’re eager to move on to the community garden and other agricultural aspects of the project in order to educate kids on where their food comes from. In addition, they’re eager to showcase the project as a place where area teens can come to learn about careers in farming, ranching and food production. It’s rare to find the combination of rancher and environmentalist and it is an honor to introduce you to this amazing mother – daughter team – cowgirls to the core! To learn more about the Malpai, click here. What inspiring work! Thanks for sharing. You’re welcome. Great to see you Myrna! I thought you’d like this one. I loved learning about Kelly, thank you for sharing this, Tammy! Absolutely. And she wakes every morning at 3 am or something to do email and then hit the range! I’m so in awe. In working with wolf issues for over ten years, one sometimes lose sight of the ranchers who care about the land and the critters. They often have to fend off criticism from both the ranching and environmental factors. Thanks for highlighting this industrious lady. Yes, you’re absolutely correct. Environmentalist and Rancher are not cohesive terms in this country. Kelly is working to change that but it takes work on the part of all of us. Informative post, Tammy. I’ve always admired the ranching woman. Kelly and MacKenzie are certainly an inspiration to all women. Well, I’ve seen you in cowgirl gear and I think you make an awesome cowgirl! That’s my favorite outfit in the world! You and Kaela need to meet them. They are a cool team Tes. Hope you’re doing well. Fascinating! While severe droughts are less common here in the Northeast, it’s still interesting to think about how you can lessen the impact on the land through community. Yes, it’s a basic concept of sharing but fascinating at this level, isn’t it? I wonder where else in our local food systems there is a reciprocal arrangement like this that would yield such benefits? I like the idea of an environmentalist rancher. It seems so obvious, you wonder why no one thought of the idea sooner. It does sort of seem obvious but then I hear about how far apart these two groups are. It’s amazing. Thank you for this. I wasn’t aware of this woman at all. What an amazing person! I love it when women embrace so-called non-traditional roles. Great article, and wonderful ladies! I stand in awe of people who use their gifts and abilities in such wonderful ways – that benefit us all! Hurrah for these two cowgirls! Great story isn’t it Paula and they’re so authentic. I love their story. Lovely to hear of someone who lives principles like this out so eminently practically, Tammy. Thanks! Isn’t though? I’m into this story. partly due to my adoration of cowgirls, i just started taking riding lessons… thanks for sharing this story, and reminding me that there’s a lot more to being a cowgirl than riding a horse! awesome story! You are so welcome. Somehow, I knew you shared an adoration for cowgirls! Thanks Tammy, for sharing about this inspiring woman and now her daughter too. It makes me wonder how many others are out there with this kind of potential and possibilities for finding solutions. Could it even be one of us? 🙂 Taking my daughter riding tomorrow . . .and there’s a Fresian mare there named Princess. He works in mysterious ways! Watch for it Debbie. Wish we all could be cowgirls! At least we can help the environment. Maybe that’s where the split is – day and night! aaaaaaaah. I’m not so certain about that. Really, I so wanted to be a cowgirl or even a shepherd in the Alps. **Sigh** Settled for being a writer instead- that way at least I can live my dreams in ink. Such a great post and a feel good read. Thanks Rukmini. Feel good is what I aim for! your title reminded me of one of my favourite compilations of short stories – Pam Houston’s Cowboys Are My Weakness. Have you read it Tammy? No but I will be checking it out! Great story! If more people thought about what affect they have on the land long term the world would be a cleaner more beautiful place. Yeah! And this is particularly interesting because they had to bring so many disparate groups together in dialogue to create it. I love the story. Wow, this is so interesting. What great work they do! Wonder if they partner with the Trust for Public Land? Thanks for the good read. They do work with State Land Trusts – Ranchers who enter into conservation easement agreements are voluntarily giving up potential future development value in order to protect their land for ranching. Therefore, if they were to lose ranching as a livelihood through changes in the administration of public land leases, and through no fault of their own, it would be unfair to penalize them with the loss of the remaining economic use of their land. In such a case, the easement may be revoked. In the case of State Trust Lands, there exists the remote possibility that the land could be traded or sold by the State and then developed. Such an action would also make the easement goals unattainable and invoke revocation. It is very important to note that should a landowner wish to have the easement recognized by the IRS for income tax deduction purposes, the easement cannot contain revocation language. She sounds like a fascinating woman with some great stories to tell! My younger daughter would love to do this kind of work. Maybe you can visit when you are in AZ. In the summer of ’05, we drove out west for the first time, and were astonished by the Malpai–the raw power and beauty of that stark landscape. We loved it. 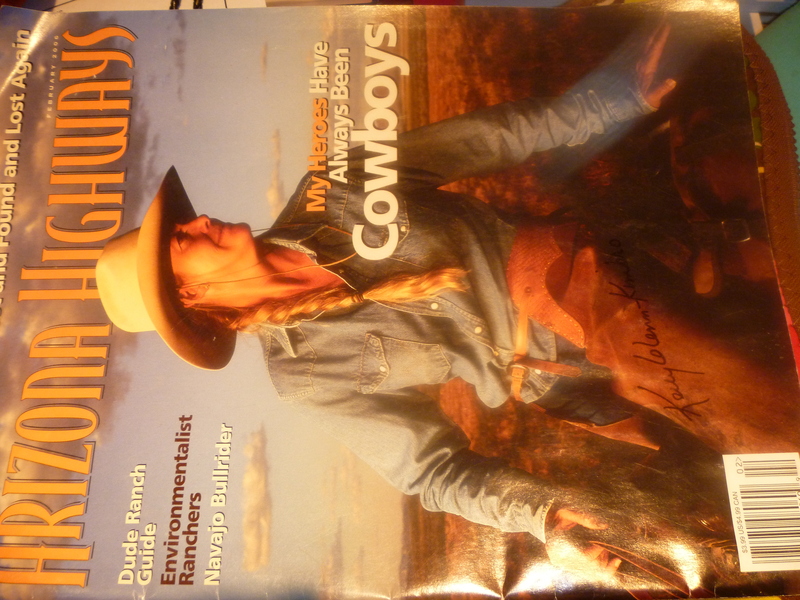 I am heartened to learn about these Cowgirl heros and the good work they are doing for preservation. thanks for the share, Tammy. you are quite welcome. Glad you’re familiar with the area that they’re working in. Real cowboys and cowgirls are truly admirable. Their rugged lifestyle, their love for nature, their passion for animals , their respect for people, their genuine and untainted spirit reminds all of us of what we lost when we embraced modern materialism. I wish I live in a country where people are simple and sincere. People who cares and honest in every way. We all need to work and support in the preservation of such a rich culture, the landscape and its jewels. We hope to see more of these projects. Thanks for sharing your passion with us. Best wishes to you and your family. I agree that we need more of these projects. What a great role model! Thanks for sharing this. My grandmother was a rancher and pioneer woman. I totally admired her and all that she accomplished. Thanks for highlighting these women. oh, so it’s in your blood and probably instrumental in your personal development. Would love to hear more about them sometime. Is there a German word for cowgirl? Thanks, Tammy for this wonderfulm & powerful post! These women are really incredible. I’m glad you enjoyed it. I think it’s tough to be a cowgirl, business entrepreneur (because that’s what farming really is…a business either small or large scale depending on size of farm/ranch) because even now in agribusiness there is alot of risk involved. In our area, there is the annual Calgary Stampede where in the city, there are some pretend cowboys and cowgirls. They spend enough money in dressing up the role. But true Alberta of all the Canadian provinces does have a real cowboy, ranchland culture/ethos outside its cities. The best bison and beef in Canada come from Alberta. Hope you find more info. on cowgirls to blog about later. Thanks Jean. I hope so too and you’re right – I think it’s really tough. Environmentalist rancher – sounds interesting. I just love everything country, no matter which part of the world they come from. There is still a little bit of closeness and a unique sense of obeisance towards mother nature in the country side. It is a combination that many people do not consider. I’m not being facetious or down-putting…it takes a woman to combine the elements of care and necessity so compatibly and comfortably! Wow, being part cowgirl, I really am impressed. Thank you so much Sons! Yeah – it’s 100% at heart. Gabby and Kelly are amazing women and they care deeply about things that matter. Would love to be on your blog roll and love for you to reblog this!